‘Tis the season for snow in Maine, but if you’re *Christi Goosman, you want it winter all year long. That’s because she is playing the White Witch in Midcoast Actors’ Studio’s new production of The Lion, the Witch and the Wardrobe, running December 8-17 at The Crosby Center in Belfast. Based on the classic children’s books by C.S. Lewis, Wardrobe tells the story of the four Pevensie siblings who travel through a wardrobe to the magical world of Narnia, where the evil White Witch and her army battle against Aslan the lion and his animal followers. 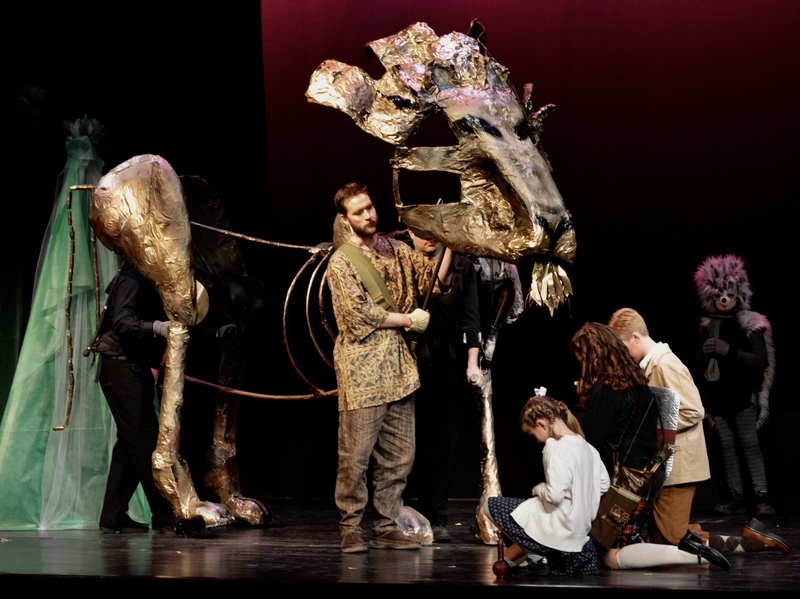 Aslan the lion comes to life in the form of a giant puppet, designed and built by Director Leah Bannister. Aslan is controlled by three puppeteers. Nathan Roach plays the voice of Aslan, as well as one of the puppeteers. Eugene Newton and Chip Curry are the other two. Playing the four children are Gracie, Erin and Chris Hayes and Maci Burgess. The adult versions of the children are played by Roach, Curry, Deb Fournier, and Jen Hart. Portland actor John Dalton Logan is Tumnus. Bryan and Bobbi-Jo Hayes are Mr. and Mrs. Beaver. Angela Domenichelli is Maugrim. Olivia Andrews is the centaur. Danielle and Marina Bannister play the dwarf and elf. Jay Holland is the professor and Father Christmas. Various animals are played by Isabelle Holt, Esme Deschamps, Sarah Joy, Teagan Fournier, Patricia Saucier, Jadon and Edna Dodge. Reilly Newton and Daniella Domenichelli fight on the witch’s army. MAS Artistic Director Jason Bannister, who serves as stage manager, producer and lighting designer, is excited about the size of the production. Both Bannisters worked together with Greg Marsanskis and Brian Ross on the set design. Linda Marie designs the costumes. Jay Rosenberg is the sound designer. Angela Bonacasa is the fight choreographer, with Roach assisting as fight captain. Ivy Lobato and Marie are in charge of props. Jen Howard, Edna Dodge and Sarah Joy head up the extensive hair and make-up design crew. An exciting aspect of the production is a special weekday student matinee for 400 RSU 71 students grades 3-5. Artistic Director Bannister hopes MAS can continue to offer weekday matinees for large school groups for the 2018 season, which includes Peter and the Starcatcher in May and The Snow Queen in December. The Crucible in October would be offered for middle and high schoolers. 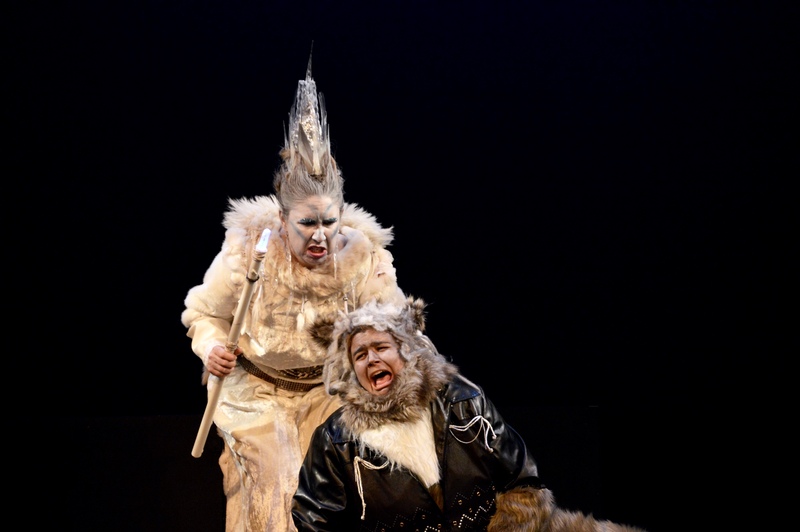 The Lion, the Witch and the Wardrobe runs December 8, 9, 15, and 16 at 7:30 p.m. and December 10 and 17 at 2:00 p.m. Performances are at The Crosby Center, 96 Church Street Belfast. Tickets are $15 for adults, $10 for students. *Christi teaches theater at Searsport District Middle School & High School and is the 2017 Waldo County Teacher of the Year. This is the first blog post of the Phase 6 Maine Arts Leadership Initiative (MALI) Teacher Leader stories. This series includes a set of questions so you can learn a little bit about the work each Maine visual or performing arts teacher or artist is doing. CLICK HERE for more information on MALI. CLICK HERE for more information on the 81 Teacher Leaders plus 4 Teaching Artist Leaders. CLICK HERE for Arts education resources. CLICK HERE for the MALI Resource Bank. Search in the “search archives” box on the bottom right side of this post for past teacher leader stories. There have been 72 posted to date. Thank you Jason for sharing your story! Jason Bannister presently teaches Theater to grade 7 and 8 students at the Troy Howard Middle School, RSU 71, Belfast. He has taught for 14 years, all in Belfast – 5 years at 4th grade, 3 years middle school ELA, 6 years middle school theater. Jason teaches 250 kids each year, one trimester of performing arts (theater primarily) each year for two years. He also directs the drama club productions and created the Maine Student Acting Competition. I have the opportunity to teach something I love to kids, to expose them to theater. The best thing is seeing a student develop an interest in theater from taking the class, and maybe joining the next production onstage. There needs to be support from your staff and administration. You shouldn’t have to sell the importance of theater arts education to them. There needs to be a proper space to rehearse, perform and store costumes, sets and props. And the class needs to be required, but with the understanding that not everyone is ‘into it’ – so you need to find interesting ways to teach kids about theater where they aren’t worried they’ll have to get up in front of the class. I have used many different forms of formative and summative assessment in my performing arts classes. Some are helpful, but sometimes the process is more valuable than the product. I was given a chance to focus on a particular unit of study I was creating for my classes. I bounced ideas off other theater teachers. I don’t get this chance very often as the only theater teacher in RSU 71. When I see a former student go on to college and major in theater. Especially when I remember them being shy or not into theater before taking my class or being in a play/musical I directed. I see some teachers using old units over and over. I am always re-inventing units or coming up with new projects. I try to keep what works well and get rid of what doesn’t. When I started my performing arts class years ago lots of kids didn’t like it. This year most kids love it. If I didn’t make changes to what and how I teach I wouldn’t be effective. I guess being a performing arts teacher in a middle school where the class is mandatory for kids to take. I worked hard to get this class created. There just aren’t lots of programs in Maine like what I’ve created. I am honored to have my job, but it’s been (and continues to be) a long road. Fight the mindset some people have about theater arts education – it IS NOT an extra fluff type of subject. You can’t just say ‘oh, well the kids have drama club after school’ – that isn’t the same. Theater arts education is so important in so many ways to so many different kids. Don’t settle – work your hardest to get an equal footing with the ‘core subjects’. That’s simple – I would put it towards building a proper theater to perform in. Enough of these cafetoriums. It’s ridiculous that there isn’t a dedicated performance space in my school district. I have regrets everyday – how I could have taught that better, worked harder to connect with a student, not said something that hurt someone’s feelings. I guess I hope when I’m that old I won’t regret the time I’ve spent teaching theater and the time I’ve missed with my own children. Committed to the development of Teacher Leaders to ensure deep understanding and meaningful implementation of high quality teaching, learning and assessment in the Arts for all students. If you are interested in becoming a teacher leader please email Argy Nestor at argy.nestor@maine.gov.